The Hidden Tower is a shop of enchanted artifacts and powerful weapons, run by the Faerie Queen herself. 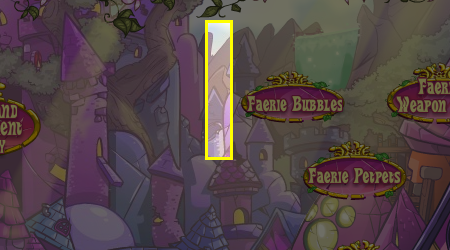 It is by far the most expensive shop in Neopia, where only the richest Neopians can afford to buy. Over the years, various faerie artifacts have been taken off the shelves and replaced with new ones, but what is it that makes the Hidden Tower so special anyway? Well, quite a few things, actually. For more information, check out our complete Hidden Tower Guide! Note: Your account must be four months old or more if you want to buy in the Hidden Tower. Of course, if you plan on ever visiting the Hidden Tower, you need to know where it is! Luckily, Faerieland is full of friendly residents and one of them made you a beautiful image (see above). Transforms into a random Current Hidden Tower Item excluding those under 1 Million NP. Destroys any of the following muffins being used against you for the rest of the battle: (Battle Muffin, Jelly Muffin, Water Muffin, Fire Muffin, Evil Muffin, Radioactive Muffin, Stone Muffin, Poison Muffin, Icy Muffin, Golden Muffin). This will change your opponent into a Yellow Chia.